Adding foliage to your home is a great way to emphasize your personal style and has a heap of other benefits such as improving air quality by reducing carbon dioxide, airborne dust and pollutant levels as well as psychological benefits like improved mood and reduced stress. 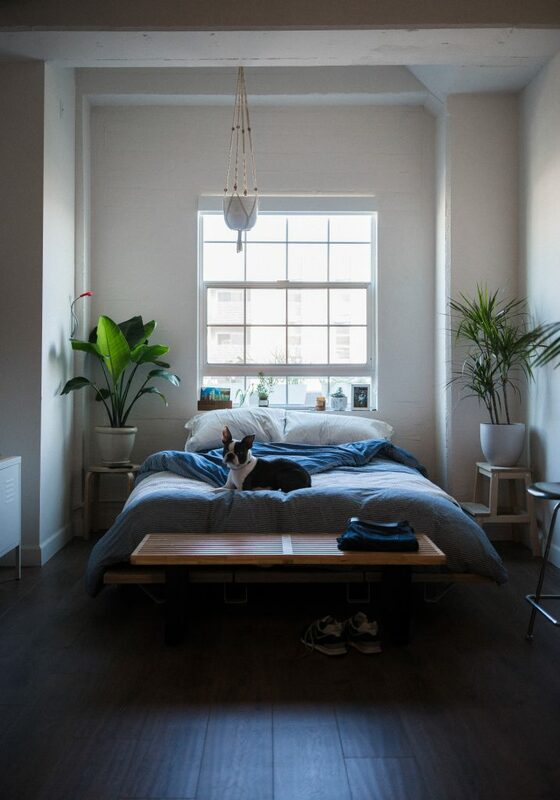 If you share your home with four-legged family members, one thing guaranteed to increase stress is when you find them nibbling on one of your house plants and worry that it might be harmful to their health. We learned this lesson the hard way when our dog devoured a Sago Palm, which is toxic for both dogs and cats. A trip to the vet and a few hundred dollars later and Bono, our dog, was fine. But it’s not an experience I want to repeat! The ASPCA has a great set of guidelines around toxic and non-toxic plants for pets, here are 5 pet friendly plants to get you started. This classic easy to care for fern is safe for pets and has an abundance of small leaves that add instant texture to any part of your home. High humidity and indirect light are essential for the Boston Fern. To make sure it gets the right level of humidity you could try keeping it in your bathroom, or if you want to keep the fern in another room of the house, use a tray of pebbles filled with water to set the pot on or mist the fern once or twice each week. The trailing foliage of the spider plant and the spiderettes it sprouts, makes it ideal for hanging baskets and the perfect plant to display in a handmade macrame plant holder. This plant thrives in a range of conditions and are very tough: great if you struggle to keep plants alive! A well-draining soil, cooler temperatures (55-65F/13-18C) and bright indirect light are ideal, although they are very tolerant of most light conditions and temperatures. Water them well, but allow to dry out between waterings. This popular blooming houseplant may have a few requirements for care but once you get into a routine you will find they grow very easily and offer year-round flowers in a range of shades from lavenders and blues to pinks and reds or white depending on which variety you purchase. All parts of the plant are non toxic to pets! Similar to the Boston Fern, these plants like humidity, so standing the plant pot on a saucer or tray filled with gravel and water is a good idea. Avoid overwatering, so allow the top of the compost to dry out between waterings. African Violets are picky about the temperature of their water too, so make sure the water is at room temperature and avoid contact with the leaves as it can mark them. Cold water can chill the plant too. Like most of the houseplants, African Violets prefer to be out of direct sunlight and like to be at a minimum of 60F (16C) during the night and 65-75F (18-24C) during the day. Turn the plants frequently to avoid the flowers growing towards the light. Providing the plant with the right conditions will ensure you get an abundance of flowers. The ponytail palm is actually a succulent, with a bulbous trunk that stores water and long curly leaves that grow out of the top of the trunk in a ponytail fashion that inspired its name. The plant is long lived and easy to care for. They prefer bright sunlight and like most succulents, prefer to dry out between waterings, so water every 3-4 weeks. The striking sculptural quality of the leaves makes this plant an eye catching accent for the modern living room. It is reassuring to know that if your cat does decide that the leaves of this plant are too much of a temptation and decides to use them as a play toy, it is completely safe and non-toxic! Haworthias are a type of succulent and part of the Asphodeloideae family like Aloes. However, unlike Aloes, the Haworthias are not toxic to pets! Haworthias look great styled in unusual, upcycled glassware with different colored sands in stripes for drainage and decorative stones for the top layer. They look good on your desk and make a fantastic gift. Keeping your Zebra Cactus happy doesn’t require a lot of effort. They will get by with most light conditions and won’t mind if you forget to water them, but avoid direct sunlight or deep shade and overwatering. Ideally water once a fortnight for a thriving plant!